Vinyl wall stickers from WallTat instantly transform any space with unique designs and images. Adding an eye-catching display to your room is exciting, but there are several reasons you may want to remove a decal. Perhaps you’re moving or looking to refresh the interior style of your home. Fortunately, our stickers are designed to detach from walls cleanly without damaging the decal itself or the surface beneath. Follow the instructions below to learn the safest, most effective way to remove your vinyl wall stickers. Remember how easy it was to apply your vinyl decal to the wall? The good news is that removing it is just as simple. Begin by gently lifting the sticker up by the edge. This can be done with a sharp fingernail, but if you’re not gifted in that regard, a razor blade also works well. You might be tempted to try removing the decal in one fell swoop, but refrain from pulling it off too quickly. This could cause it to tear or take some paint off the wall, and we certainly don’t want that. Pull the sticker off gradually to get a sense of how firmly it’s stuck to the wall. In most cases, it should separate quite easily. However, if you’re experiencing difficulty, you can accelerate the process with a basic household item. Use a hair dryer to slowly heat the edge of the sticker. Even the most stubborn decal should start to peel away. Remove the decal by sections, applying heat to each area as you go. You shouldn’t see any residue on the surface underneath, but if the sticker left behind a little reminder of its tenure on your wall, don’t fret. Carefully wash with soapy water to remove the trouble spots. You can also try adhesive remover, nail polish remover, or WD-40, but make sure they won’t damage your specific type of wall before attempting. For decals attached to glass surfaces like windows, doors, and mirrors, you can still follow the above steps to ensure safe and easy removal. You might find that some stickers cling a bit more tightly to glass, so it may be a good idea to skip the fingernail or razor approach and begin with a hair dryer instead. Our frosted glass vinyl decals are made with a permanent adhesive material, meaning you may need to use a heat source for removal. A glass scraper can also help if necessary. If you require more detailed removal instructions or have questions, feel free to contact us at info@walltat.com. 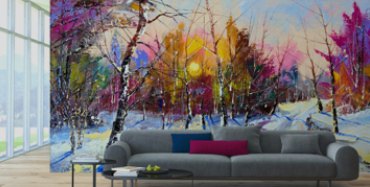 Want something new to fill that suddenly bare space on your wall? You can find the perfect vinyl wall stickers at WallTat!